The Pound closed relatively unchanged yesterday as Brexit uncertainty prevails. EU's Chief negotiator Barnier repeated that there's no solution yet to the Irish border issue, while British Trade Secretary Liam Fox said that he didn't rule out voting for a no-deal next week as it wouldn’t cause an 'existential threat' to UK’s economy. Furthermore, BOE's Cunliffe said that he expected a gradual tightening of monetary policy adding that the Pound will substantially be affected depending on Brexit's outcome. Today, the UK will release the Halifax House Price Index for February, while on the Brexit front, no major news will be released until next week's Parliament discussion on May's plan. 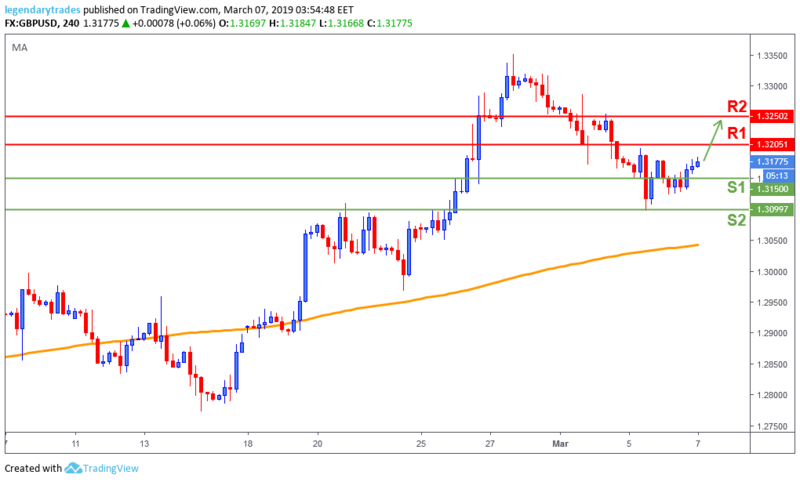 The Pound bulls kept price above 1.3150 (S1) after multiple attempts from the bears to break below it. Price action started to look bullish as 1.32 (R1) is likely to be retested. A break above it will confirm that the buyers took back control and will try to retest 1.3250 (R2).